Why pay $99+ for the leading brand when you can build your own PIC programmer for under $10!!!! Some PIC programmers sell for $99 and you have to go to a boring seminar. The PicBlaster can be built for under $10 - no boring seminar. Other leading brand MAIL ORDER programmer kits sell for at least $30 + s&h! Why WAIT for the mail man when you can use readily available parts from your junkbox? The leading brand programmers program several different chips. 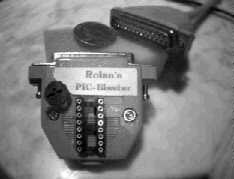 OK the PicBlaster only programs the 16c84 (so far), but it programs FAST and no waiting for the EPROM to erase. PIC16c84 programmer that fits inside a DB25 hood! The design is pretty self explanatory as shown in the picture above. Drill holes for the IC socket on the hood and fit it in. If you use small components, the whole thing should fit snug inside the hood. You might even want to try surface mount if you are brave. I used a good quality machined socket. To keep the socket firmly in place, I dripped hot melt glue around the edges of the socket and hood. To program a chip, I just popped the programmer into the back of my laptop computer SERIAL port, lightly pressed the chip into place, and ran the program. This is a very handy device, especially for those who work out in the field. Check out the schematics and download the software. The plans are for a 9 pin connector. If you want to use a 25 pin plug or are having trouble with programming, check out my troubleshoots. Antti Lucas drew up the schematics and wrote the pip-02 software. Check out his web site.